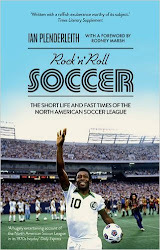 "Written with a raffish exuberance worthy of its subject, Rock n Roll Soccer offers a more generous take [than the common perception] on the ill-fated NASL. Yes, it was foolishly short-sighted to try to establish clubs in places like Las Vegas and Hawaii, but there was plenty to admire about the audacity and enterprise of a project that brought together footballers like Pelé, Eusebio, George Best and Franz Beckenbauer. In forcing Association Football onto the radar of US popular consciousness, it ultimately paved the way for the more sustainable, low-key success of Major League Soccer. If the enthusiasm of the American public during the recent World Cup is anything to go by, it hasn't all been in vain. "Rock n Roll Soccer challenges the parochial assumptions that have skewed the NASL narrative in England - in particular, the idea of English football as a paragon of sporting authenticity. The English football culture of the 1970s was far from perfect: on the pitch, tactics were increasingly defensive and negative; off the pitch, as Ian Plenderleith correctly observes, the hooligan violence that blighted the decade 'no more reflected a passion for soccer than cheering teams of choreographed dancing girls and cheap hot dog promotions'. "Plenderleith maintains that the NASL was actually ahead of its time, its showbiz trappings, a harbinger of the brazen commercialism that would come to dominate the English game from the 1990s onwards, with the advent of Sky TV and the English Premier League...."